A unique My Boobies Rock Sweatshirt like this is a great way to get you noticed. Spread Breast Cancer Awareness every time this sweatshirt is worn, whether you're at breast cancer awareness events or just out doing your everyday activities. Showing your support for Breast Cancer Awareness is an important step in the fight towards a cure. Our Breast Cancer Awareness Sweatshirt is a great way to support the fight against Breast Cancer. This Breast Cancer Awareness Sweatshirt is available on our premium cotton/poly blend sweatshirt, machine washable in youth sizes XS-L and adult sizes S-3XL. Additional Info MyWalkGear.com is your one stop shop for Breast Cancer Awareness Apparel . Show you're a true supporter with one of our fun and eye catching designs to spread awareness today. 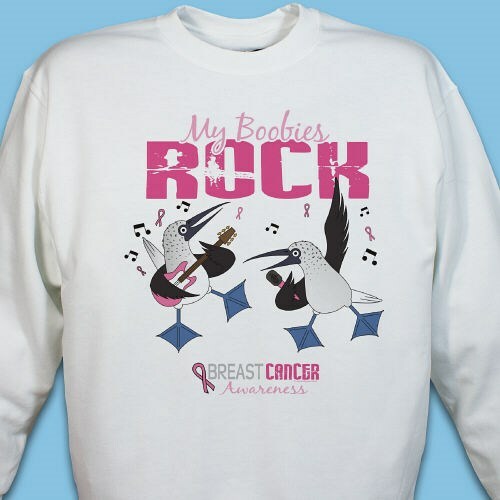 This fun Breast Cancer Awareness Design is also available in a Boobies Rock Hooded Sweatshirt and a Boobies Rock T-Shirt as well.